Venezia Innovative Services is a Day Program service provider for the Elderly, Blind and Disabled (EBD). We offer a welcoming, warm environment where participants live their lives to the fullest. Our facility is fully handicapped-accessible for people in wheelchairs. We intend to accommodate people who speak other languages than English such as French and Spanish. The agency has two French-speaking staff and one Spanish-speaking staff. However, our handouts and the participant materials that our potential French and Spanish participants will sign or take home will be available in English only. Venezia Innovative Services provides personal storage units for its participants to put away their personal belongings while at the day program. Medical and other emergencies can occur while the day program is in session. Our staff are prepared to meet these emergencies such as falls, seizure, chest pain, diabetes, bomb threat, gas leak, tornado/severe winter snow/blizzard and fire, efficiently and effectively. Venezia Innovative Services serves people with a variety of chronic illnesses and/or physical and cognitive challenges. The center does not discriminate based on religious background, gender, ethnicity or sexual orientation. 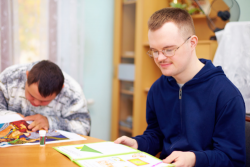 Each person who needs our services will be considered for admission on a case-by-case basis and our staff are trained appropriately for each additional population to be served. Venezia Innovative Services strives to keep its services affordable for participants. We accept Medicaid and private pay. We make it easier for all private pay families. With Venezia, there is no lunch box. We do provide lunch for all clients and the clients choose what to eat. There is no money involved in during activities. All activities are paid for. For instance, zoo, aquarium, museums, butterfly pavilion, all are paid by Venezia. We are open 6 days a week, Mondays to Saturdays. To know more about our services, feel free to contact us at 303-537-5078 / 720-297-1002.